In this series of 30 daily articles celebrating the upcoming 30th Anniversary of Super Mario, various members of the Nintendo Life extended family will share their memories and thoughts on the iconic franchise. Next up is Editorial Director Damien McFerran. Tetris is widely regarded as the game which sold the Game Boy to the world and turned it into a commercial smash hit, but for me personally, it was Mario's first DMG-01 outing which made me desire the portable system more than water, food and oxygen. The year was 1991. I'd just moved house and was about to start at a new school, and as always there was that thorny issue of making friends. I'd moved to a new part of the town of Hinckley, Leicestershire and as a consequence knew nobody; bonds had to be formed using the traditional weapons of the pre-teen era: football (soccer to our American readers) and video games. As I had, at that point, only a passing interest in the former, it would be the latter that really broke the ice with my newfound neighbours. A kid across the street called Ed proved to be my first new chum, and it was Nintendo's brick-like handheld system that provided the foundation for our budding friendship. At the time I was a card-carrying Sega fan, having received a Japanese Mega Drive the previous Christmas. I'd dabbled in home computers beforehand, owning an Atari 800 and Atari ST, but Sega's 16-bit machine convinced me to take my gaming to the next level of obsession, and I would buy every magazine going in order to learn more about games in general. UK publications Computer & Videos Games and Mean Machines were my personal favourites at the time, and it was in the pages of these two fine tomes that I would first lay eyes on the Game Boy. To a child in the '90s, it represented something truly incredible - the ability to enjoy console-quality gameplay outside of the house. Nintendo's reputation as a creator of amazing gaming experiences naturally added to the allure, but it's vital to stress that I'd never played a Nintendo console game up to this point - my only experience with the company's output was a Donkey Kong II Game & Watch. I never owned a NES - in the UK, Sega's Master System was the dominant 8-bit platform - and as such, Nintendo's quality was something I only knew about second-hand, lifted from the glowing reviews in Mean Machines which attested to the incredible playability of the company's library of games. Ed's Game Boy therefore became a particular point of fascination for me; Tetris looked interesting but without the chance to pour hours of gameplay into it, it seemed too abstract to really grip me on looks alone. It would be Super Mario Land which would truly hook me in and make the Game Boy a desirable object in my young eyes. 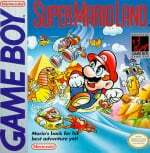 This in itself is quite ironic as Super Mario Land is often seen as the runt of the series; directed by Satoru Okada and produced by Game Boy creator Gunpei Yokoi, it was the first Mario title to receive little-to-no input from series creator Shigeru Miyamoto, and as a result it felt a lot different to what had gone before. The Mushroom Kingdom is abandoned in favour of the mystical Sarasaland, complete with oddball enemies like UFOs, sphinx statues and robots with flying heads. As Super Mario Land was only the fourth Super Mario game at the time of its release in 1989, these differences appeared to be less pronounced than they are now; it's only the passage of time - and the repeated use of several Super Mario tropes in subsequent games - that makes this handheld offering appear so unique. 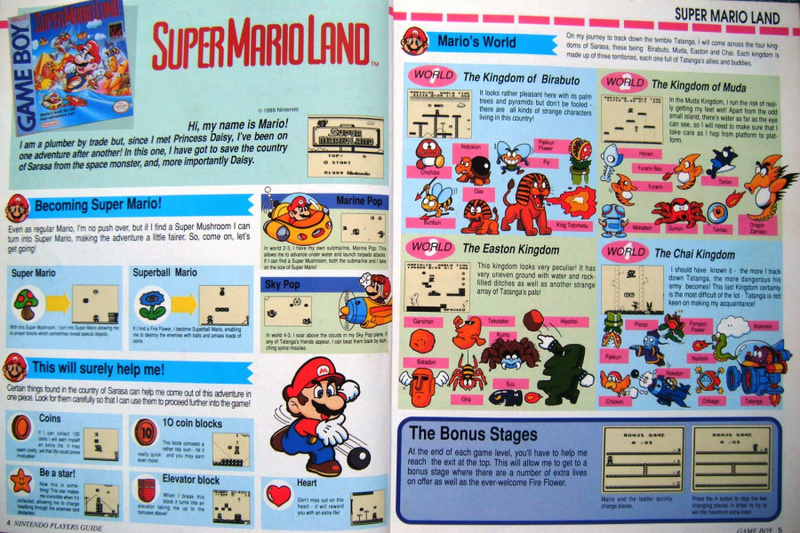 Super Mario Land boasted other innovations, such as a "lucky chance" game at the end of each level which would allow you to earn more lives and fast-paced side-scrolling shooter sections. The game was clearly designed with the Game Boy's limitations in mind; the sparse visuals aimed to avoid problems with the console's blurry LCD display, while the tiny enemies allowed the designers to fit more on the screen. Subsequent Mario games on the console bumped up the graphical detail and adopted more traditional themes, but there's a simplicity to the original which endures even to this day. When I hear Hirokazu Tanaka's distinctive music and see that boxy, ill-defined main sprite running along, I'm instantly taken back to 1991, sitting in Ed's bedroom waiting patiently for my turn on his coveted Game Boy. As it happened, I had to endure a long wait, and wouldn't actually get my hands on my very own Game Boy system until a year or so later. My dad owned a video rental store and was given a free Game Boy console when he placed a bumper order for Terminator 2: Judgment Day on VHS, and thankfully this unit would find its way into my waiting hands. Super Mario Land was naturally one of the first titles I invested in, and I still return to it every few years. It's possible to finish it in a few hours, and while the lack of challenge may have been a concern to reviewers back in the early '90s, to me it represents the perfect way to spend an evening - allowing nostalgia to wash over me as I enjoy the game which will always been considered an outsider by Mario fans, but nevertheless introduced me to the world of portable gaming, and Nintendo itself. I'd played SMB quite a bit, but SML was the first Mario platformer I owned and I liked it a lot. It's still fun to blast through and I loved the music - I even picked up the 7" that was released. Very fond of this game - first Mario title I played and on my first Nintendo system too. I have completed this game so many times, know the location of all the hidden blocks too. It was the start of a beautiful friendship! Still my personal favourite 2D Mario title. Not sure how many times I completed this back in the day, or how many times I've completed it on my 3DS now. Great music, great levels and just like Link's Awakening, it has a ton of fresh ideas that haven't been used again, which is a crying shame. Bring back Mario in an aeroplane fighting aliens! Love it! I definitely has it's charm. I recently picked up a DMG Game Boy and installed a backlight mod. This really helped a lot. My first Game Boy was the Game Boy Color in 1998 when I was a senior in high school. That did not stop me however from diving into the world of monochrome Game Boy games, but recently picking up an original led to a greater appreciation for the monochrome library. One of my favorite games as well I was playing in on my Gameboy non stop in 1993. Agree that it's special and everything. When I got my Gameboy that first year I had this, Castlevania and Tetris. At the time this was an impressive game and I spent a lot of time with it. Looking back on it, I don't remember it as fondly but it is still an impressive achievement. I got this the year the Gameboy came out for Christmas. I remember playing it thinking "hmm this is a weird mario game" but after mastering the controls I was sucked in. It's still impressive to see a mobile gaming device churn out that quality of gameplay back in 89. And then Super Mario Land 2 came out later and blew this one out of the water. Impressive stuff. Probably one of the weakest Mario platformers out there but even then it still has its charms. First Mario title I owned. Fond memories. I just introduced my son to this via 3DS VC and I was surprised that he took to it, given the GB visuals. He's really enjoying it! The desert music still pops into my head. Such a pleasantly odd game. Glad to see other people liking this game. I personally think it's loads better than the sequel. Short but sweet. I remember beating it twice in one afternoon; once on normal, and once on hard. I think a few newer Mario games could take a few pages from the Land games. And if a Super Mario Maker patch (or portable version of Super Mario Maker) was to be made, this should be added as a style. My first Gameboy game (with Tetris) on my first Nintendo console and I've been hooked every since. Actually gave this a play through on my Super Gameboy a few weeks ago... love the music and the level designs are still great fun. I remember my older brother had one he told me pressing a,b, start and select would open extra levels... of course it just reset my game... good times. Super Mario Land was the first video game I ever played. I still play it o re tty frequently on my 3DS. Easily one of my favorite Mario platformers. Damien's reading through those pamphlets of Club Nintendo before owning a Game Boy reminds me of when I kept reading through the promotional mini player's guide given out by Nintendo Power, during the summer leading up to the release of Pokemon Red/Blue. I knew Bulbasaur was going to be my first choice ahead of time to practically solo everything, and I think Damien probably knew exactly how to deal with every situation in SML. I never played this, but I did play it's sequel, 6 Golden Coins. It wasn't bad but it didn't click for me personally. Glad to see the community here has fond memories of this game, because even though they had their limits the Game Boy games were good in their own right. It'd be nice if they could add the SML skins to SMM. I miss playing that game. Nice feature. I got a Gameboy early in its life, but I ended up with Mario Land as my first game for it because I received the machine used. I still don't have a copy of Tetris. I loved the game and it was one of the titles that really sold me on the Gameboy. The visuals are sparse with small sprites, but everything looks good and it has a lot of charm as a result. The sound was memorable too. It's impressive for being such a tiny game in terms of ROM size. It's a game that still pops into my mind from time to time, and I just played through it again a few months ago. Great article! SML made the GB a must have for me as well. I loved the submarine and airplane levels, I wish vehicles would come back in future Mario games. I have a similar story about playing and loving Super Mario Land as a child. It was my favorite Gameboy game and I played it so much and I always needed new batteries. My favorite level was the Egyptian themed one and I loved the music. "A few hours"? Land is along the shortest Mario games ever. I still love it, the music and all. Anyone who might like a video game rap-over full of swears and won't mind some casual misogyny should look up "Action Adventure Super Mario Land" by 8-Bit Duane. I can't remember which was the first Super Mario game I've played.....the fan game that was on PC or the original Super Mario Bros. Either way, both are fun games to me. I feel that Land 2 is in all ways better than the original simply because its improvements are noticeable and its got creative level design filled with short bursts of fun. The Land series are the only Mario games that I visit now and then and are considered my favorite Mario games of all time. the music was fantastic I can remember to this day most of the tunes they are that memorable. The submarine and airplane levels were a breath of fresh air from the platforming and the difficulty was just right for me as I sucked at SMB but managed to complete SML after a few attempts. Up there with super Mario Galaxy as one of my favourite Mario titles.